The hospital bed is, of course, one of the most important items to be found in any medical facility, as it is here that the patient will spend most of their time. Early beds were simply that - a place where the patient could rest in comfort. As technology progressed the hospital bed began to become more flexible and it was only a matter of time before routine medical systems began to be incorporated as standard, leading to the early versions of the device which has come to be known as the Biobed. 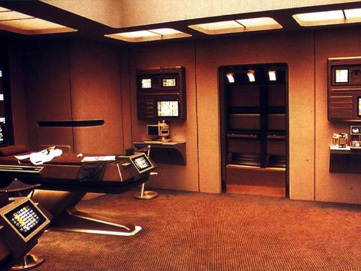 Today, the Starfleet biobed is designed to provide the medical staff with a wide range of basic information on the patient. Inbuilt sensor systems allow the biobed to constantly monitor factors such as heart rate, respiration, temperature, etc. These are displayed on a permanent basis, usually on a panel located at the head of the biobed, so as to present the information in the most clearly and easily accessible manner possible. As a backup to the visual presentation, biobeds can be set to give audio information, including normal functions such as heartbeat or automatic alarms should any body function fall outside a pre-set range. The use of biobeds essentially means that every hospital bed today is equivalent to - or in fact, superior to - the "intensive care" beds of centuries ago. However, it is simply not resource efficient to include every type of medical device on every biobed. While the goal posts have shifted, then, even the most modern medical facilities still maintain a relatively few "high technology" beds supplemented by a much larger number of standard biobeds. An advanced medical system designed to scan damaged organs on the quantum level and replicate living replacements which can then be transplanted. The system was created by Doctor Toby Russell, an expert in spinal injuries. The Federation refused Dr. Russell permission to test the device on a patient on three separate occasions, on the grounds that the risks were unacceptable. In 2368 she used the device on Lieutenant Worf, who had been paralysed after an accident on board the Enterprise-D. 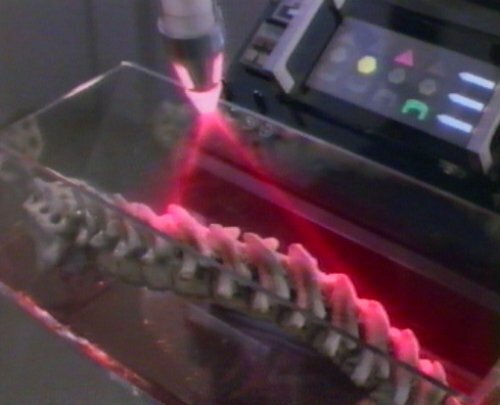 The Gentronic replicator succeeded in creating a new spine, but Worf died on the operating table. Fortunately, his Klingon physiology allowed him to be revived and make a full recovery. The Hypospray is a simple and effective method of delivering substances intravenously to a patient. The device consists of a spray head which can deliver drugs painlessly through the skin, and even through clothing. Attached to this is a swappable vial which contains the drugs to be delivered. The Hypospray has several major advantages over the syringe; since the skin is not broken by the spray, there is no contamination of the hyposprays tip during an injection. The device can therefore be used repeatedly without any need for sterilization of the tip. The hypospray is also completely painless, which has helped to make the widespread fear of injections a thing of the past.